While in the Reserve there is even an optional zip line you can try! This is the perfect adventure tour for families with kids of all ages. Meeting point: La Isla Shopping Village Cancun (Blvd. Kukulcan KM 12.5 @ the main entrance) Daily tours, rain or shine, all year long! Round Trip transportation is available from the Riviera Maya for an additional cost of $20 - $30 per person, depending on hotel location. See shopping cart on next page. 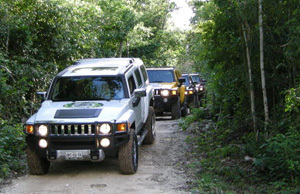 Each tour includes your own Hummer for up to 5 people, Fuel, Experienced adventure guide, Tour and entry to Ruinas del Rey (The Kings Ruins), entrance into private reserve, a swim in a sacred underground Cenote, lunch in a restaurant, tour of the town and your entry fees into the CrocoCun Zoo. While in the Reserve there is even an optional zip line you can try! Tour and full access to Mayan Ruins with more than 400 iguanas! Swim, cliff dive, or snorkel in underground natural wells. (2 different cenotes) and experience the zip line ride inside the cenote. Experience the ultimate 4X4 drive in the jungle and in the swamps. Sharing your vehicle depends on the people that are booked for that day, in any case you will be able to drive it.